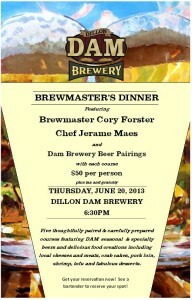 Hosted By Brewmaster Cory Forster & Chef Jerame Maes. Join us as we kickoff the Lake Dillon Brew Festival. Five course menu & beer pairings: Artisan Cheeses from Roth Creamery & Oak Aged Dam Gogh; Crab Cake with Chipotle Aioli & Paradise Pilsner; Arugula Citrus Salad & Exit 205 Session Ale; Coffee Spice Encrusted Pork Loin & Black Rye IPA Or Shrimp or Tofu Indian Curry & Dam EPA; Apple Strudel with Black & Tan Ice Cream Float & Whiskey-Barrel-Aged Porter. $50 Per Person. Call Now 970-262-7777 !